GOGCCFLAGS="-fPIC -m64 -pthread -fno-caret-diagnostics -Qunused-arguments -fmessage-length=0 -fdebug-prefix-map=/var/folders/cd/_7rcv5812531s2lswhn6kp680000gp/T/go-build436968147=/tmp/go-build -gno-record-gcc-switches -fno-common"
Also happened on linux/amd64, see below. A bug in production showed an http2 client hanging more than 250 seconds without respect to the request context which was set to timeout after 5 sec. All possible timeouts are set on connection and TLS handshake and I didn't see many dials (they are monitored). Clients are using net/http2.Transport directly. The requests should have timed out after 5s. No or very long timeouts (I believe the server has reset the connection or TCP timed out). // flush). Without respect to the context's deadline. 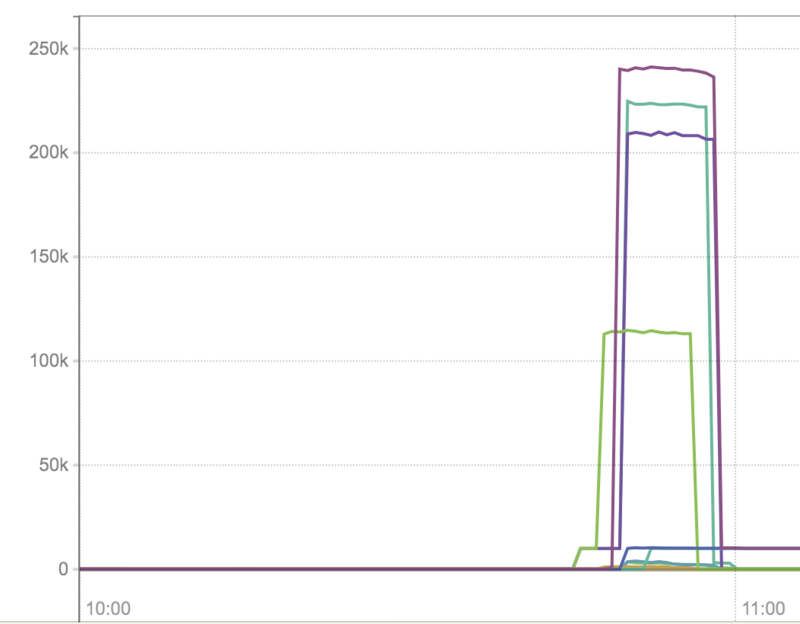 Also I don't think it sent 1MB headers when it failed in production something else must have fill the buffer. The buffer is on the connection and shared among streams the buffer can be filled by other requests on the same connection. Besides this particular call which is synchronous, no write nor read to the connection has a deadline set. Can't this lead to goroutine leaks and http2 streams being stuck in the background ? Working on a patch to fix this, I realized that using the context deadline to timeout the i/o calls may not be appropriate. Timing out the I/O might leave the framing protocol in an inconsistent state and the only safe option would be to close the whole connection. Probably not was the caller intends when the context deadline times out. It would work if the deadline was set on context only for this purpose just before doing the request but that's usually not the case. I think there should be an I/O timeout option to the transport that would serve the purpose of timing out the I/O calls and every I/O calls would set the deadline to now + timeout and reset it after the call to Read or Write. I'm going to implement this for now. Let me know what you think about it. cancelation systems (context, Request.Cancel, ...). This adds read and write deadlines support. after a complete block before at least IOTimeout. write buffer. Without respect to the context's deadline. blocks forever if the buffer is flushed to the socket. if the user said 5 seconds timeout on a request, the control channel should notice and return an error to the user's RoundTrip. I'd be surprised if this part isn't already working? There are cases where this isn't working. I believe the graph and tests demonstrates it. Unfortunately, the writes almost never time out I don't know if this is specific to my use particular use case or if buffering makes it very long to happen. I run this CL in production for a very specific service that only makes requests to APNS and Firebase push gateways. The patch helps to recover from stuck connections and kills it but it's slow to converge, is incomplete and may not work properly for the general use case. What happens is that there are situations where the APNS gateway is blocking the connection, it behaves like a firewall that drops packet never reset the connection. Most of the time the requests are timing out correctly, the context allow to unlock the client stream goroutine and return to the caller however the connection read loop never times out nor receive any other error causing all requests to time out. (Also not that the APNS gateway doesn't allow pings). What I see most often is the writes are not timing out. I believe that the only way to guarantee to time out the connection is have a way to unblock the read loop. The reads (ClientConn) are asynchronous to the writes (ClientStream) so we have to find a way to add a deadline on the reads that will follow the writes (requests) or that follow a read (e.g reading the rest of the body) from the client stream side. The CL takes a simple approach and avoids synchronization between the client stream and the connection read loop. It resets the read deadline and sets a write deadline before every write from the client stream. After the write is done, it sets the read deadline. This kinda work, I see the that connections are no longer stuck forever but it is slow to time out the connection. Resetting the read deadline before every write continuously pushes back the deadline. Also there are no read timeout when waiting for subsequent body reads for example. Upon waiting for something from the network on the ClientStream / caller side, push a deadline in a heap data structure (probably under ClientConn.wmu lock) keeping track of the stream that pushes it. If there was no deadline, unlock the read loop by setting one in the past an set the deadline before next read. Before every read look at the root of the deadline heap and set it. After every read remove the deadline of the stream that has successfully completed the read. We need some sort of reverse index to find the entry in the heap and remove it (maybe every client stream can track it's unique read deadline entry in the heap).